Bertolt Brecht wrote his mordant anti-Nazi satire, The Resistible Rise of Arturo Ui, in 1941 while living in Finland, waiting for his visa so he could enter the United States. 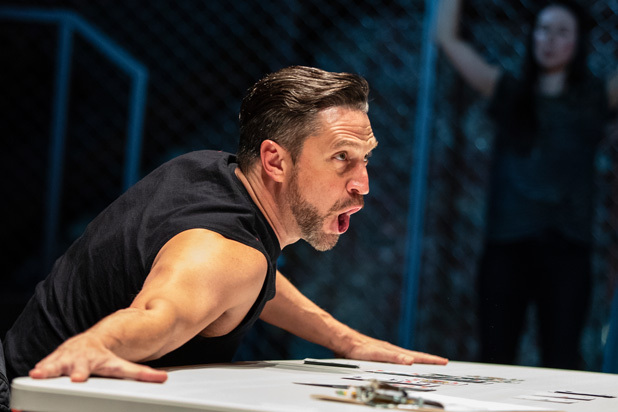 Perhaps looking forward to leaving, Brecht set his play in Chicago, and its lead gangster (who’s from New York) takes over the lucrative “cauliflower trust” and rises to the top of the windy city’s underworld. Doyle also doesn’t have his Arturo Ui—played by the vibrant and charismatic Raúl Esparza—look like tRump in any way, except for a nice bit during Ui’s climactic rise-to-ultimate-power speech when he wears a red tie. The dazzling Esparza turns on the charm and the exaggerated Brooklyn accent as he badgers, cajoles and convinces his followers and enemies how much his “protection” will improve their lives. Doyle has staged Ui as an ensemble piece, letting all cast members share in narrating the Hitler timeline, although his double- and triple-casting a few of the roles might confuse those in the audience unfamiliar with Brecht’s play. But Esparza guides us thrillingly through a blackly funny tale made all the darker by, in Brecht’s final warning, the fact that it could be happening again. And no amount of gallows humor will save us.